For use in Awlgrip/Awlcraft 2000 Topcoats. Hot weather reducer (90 degrees to 105 degrees Fahrenheit). 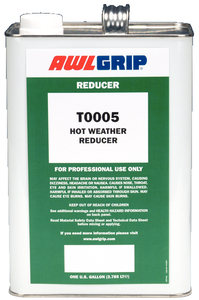 T0005 is most often used as an additive, blended with other spray reducers to improve flow.